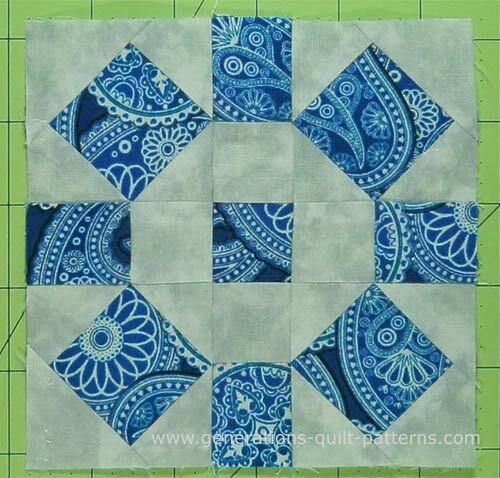 The Rolling Square quilt block is made from 2 fabrics. Its 5x5 grid is sometimes referred to as an uneven nine patch. 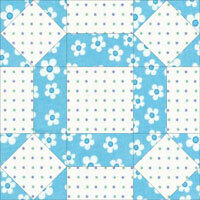 It is made with Square in a Square and strip pieced units. Let's begin our Rolling Square block! 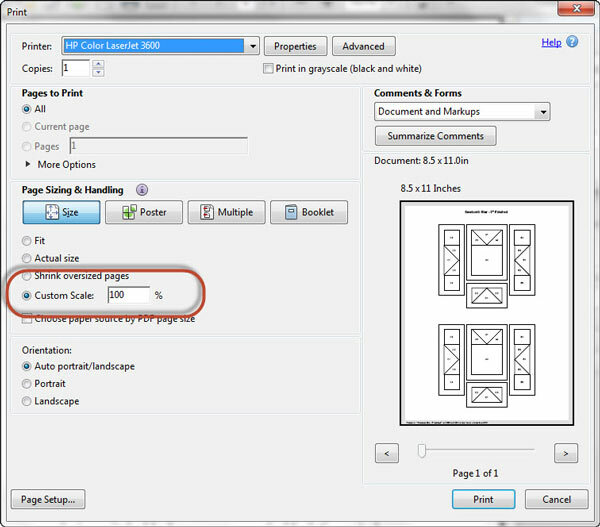 Print your chosen block size from the table below. 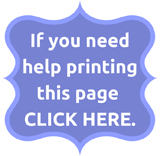 Measure the patterns to confirm they printed at the correct size. 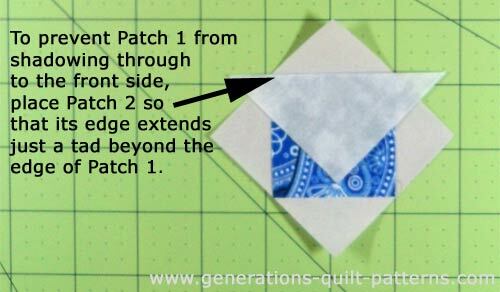 Patches #2 thru #5 are generously cut to make placement foolproof. After making a couple of blocks, make any needed adjustments to the measurements and note for future reference. 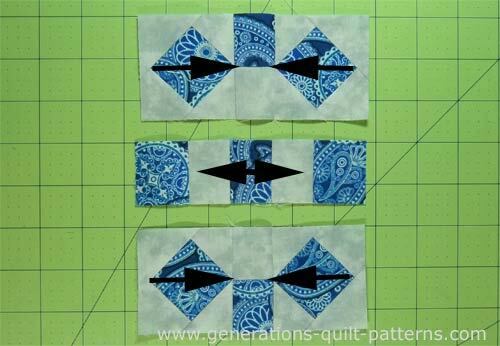 The strip piecing strips are cut a bit longer than needed to allow for some straightening cuts. 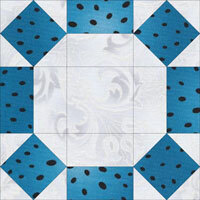 2, 3, 4, 5	 L	 8	 2⅜"	x	2⅜"	 2⅞"	x	2⅞"	 3⅜"	x	3⅜"
Cut four patterns from the downloaded pattern sheet. A rough cut it good enough; no need to spend time cutting on the dotted line. 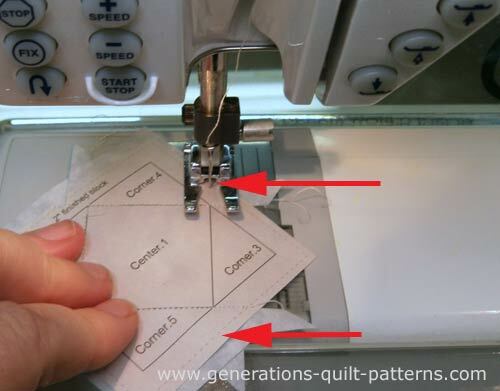 Reduce your stitch length to 15-20 stitches per inch for paper piecing. 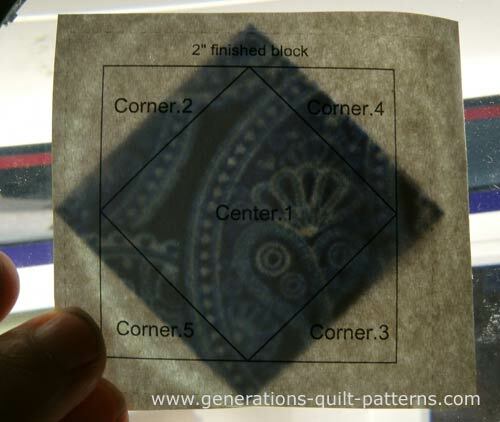 With a dab of Elmer's Glue Stick—the kind that goes on purple and dries clear—stick the wrong side of a Patch Center.1 to the unprinted side of the pattern, centering it as shown below. The center square is quite dark with much lighter corners. To prevent the darker fabric from 'shadowing through' to the top of the block, position your Corners.2-5 so that their edge extends just a wee bit past that of the Center.1. That way you won't need to go back and trim the darker seam allowance. Stitch a light Corner.2 and Corner.3 to two opposite sides of #1, starting before and stopping after the solid stitching line. Stitch the Corner.4 and Corner.5 to the two remaining sides. Remember to start before and stop after the black stitching line for secure seams. To reduce unnecessary bulk trim away any dog ears and then press. Repeat for the three remaining SiaSs. In this pre-trim photo notice that the outside thread tails are still intact. There was no need to cut them off during construction because they'll be addressed when the blocks are trimmed to size. 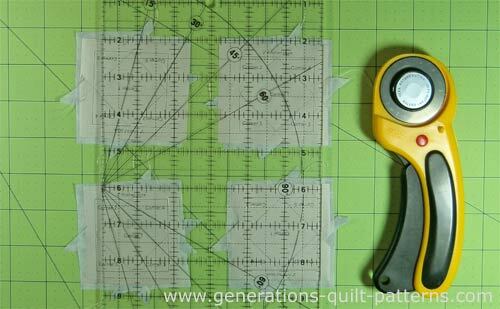 Trim the patches with your rotary cutter and ruler. 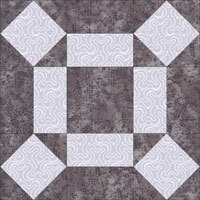 For a more detailed description of paper piecing this Square in a Square unit, click here. With right sides together, sew the light and dark 7" x 1-1/2" strips together along the long side. Press with the SA toward the darker fabric. This stripset for the sample Rolling Square is 2-1/2" wide. Use the chart below to check your stripset for accuracy. Straighten one short edge with your rotary cutter and ruler. Remove the paper from the SiaS units. 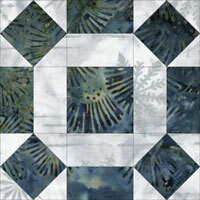 Arrange the cut and pieced units into the Rolling Square design. Stitch the units in each row together. Press SA in the direction of the arrows below to reduce bulk. Stitch the rows together. The SA nest to make matching them easier. It is helpful to use pins particularly where the point of the SiaS unit meets the seam line of the strip pieced one. Press with the SAs away from the SiaS to reduce bulk. 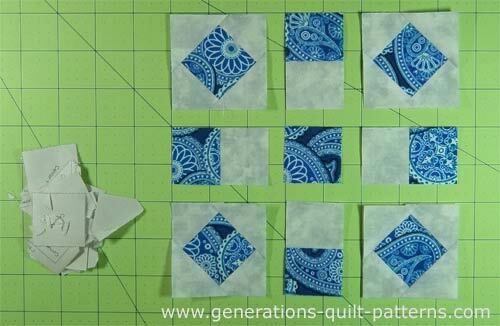 Your finished Rolling Square quilt block will look like this. Our Rolling Square quilt block—ready for a quilt! 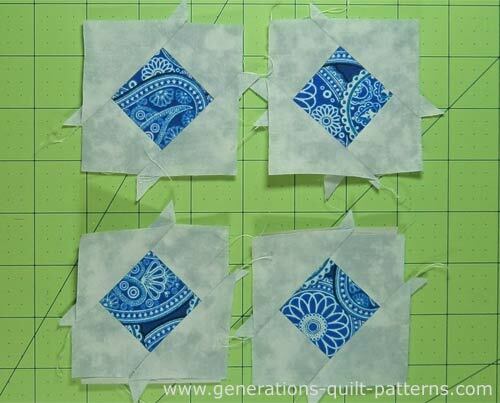 More often you'll see the Rolling Square quilt block design drawn on a 6x6 (aka Nine Patch) grid like the patchwork designs below. A two fabric block. Notice that the dark center is gone. This version is drawn on a 6x6 grid. The dark center is back! All color placement is reversed. This variation is also know as Broken Wheel. Different fabric placement really changes the look. 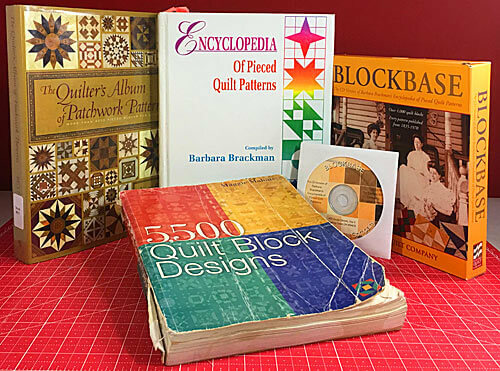 Now that you're Rolling Square quilt block is finished, check our Free Quilt Block Patterns Library for more hip-to-be-square blocks to make!